*Simply a contract between you and and insurance company that is guaranteed by the full faith and credit of the underlying issuing company's ability to repay premiums. Considered to be safe to to the regulation and supervision by the state departments and the legal system. Offer unique tax advantage. With most other investments you pay taxes each year on the interest you earn whether or not the money is left or taken out. 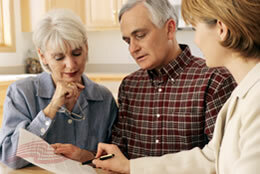 With annuities the interest earnings ARE NOT taxed until taken out. In turn, the values can accumulate much faster.